Science continues to explain what we’ve known for a long time. Mothers should eat in a healthy manner while pregnant! Intriguingly, researchers had found evidence that the binding protein’s gene had been silenced by an epigenetic switch – the DNA equivalent of a padlock that can be put in place for various reasons, typically environmental ones. Their findings suggested that the gene for IGFBP-2 in the liver was edited early in life, setting the mice up for type 2 diabetes later. While most popular theories suggest that chronic diseases are caused by genetic factors and lifestyle, scientists now understand that environmental factors are also at play — and not just over long periods of time. Your mother’s nutrition during pregnancy plays a big role in your adult health and risk of Type 2 diabetes and metabolic syndrome. This theory started with Barker’s hypothesis of 1992. The Oregon Health Sciences University (OHSU) summed up David Barker’s work well. Over twenty-five years ago, he [David Barker] was the first to show that people who had low birth weight are at greater risk of developing coronary heart disease and diabetes – now a widely accepted fact. 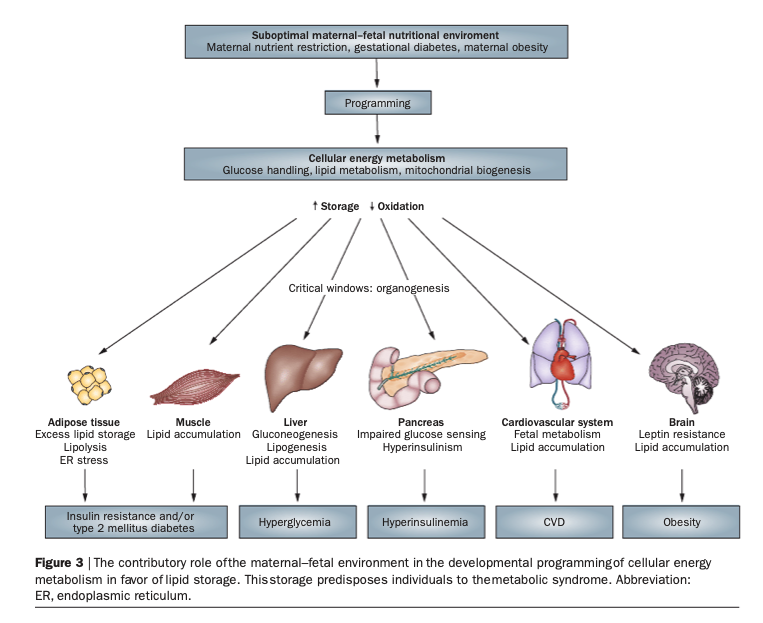 This finding led to a new understanding that chronic adult diseases are “programmed” in the womb by malnutrition and other harmful influences. A decade later, the World Health Organization published a piece called “Programming of chronic disease by impaired fetal nutrition: Evidence and implications for policy and intervention strategies” calling for further research. The New Yorker also wrote a much more approachable piece called 2007 called “Small and Thin” about this topic, which was still considered controversial even by 2007. Source: Symonds, Michael & Sebert, Sylvain & Hyatt, Melanie & Budge, Helen. (2009). Nutritional programming of the metabolic syndrome. Nature reviews. Endocrinology. 5. 604-10. 10.1038/nrendo.2009.195. I personally became very interested in this topic back when I found out I had diabetes back in 2003, as I believe that I was personally impacted by epigenetics. While I am not from an impoverished region, my mom — who is known among friends and family to always look her best — only gained 10 pounds when she was pregnant with me. She had boasted to me once that no one even knew she is pregnant until she was 8 months in! 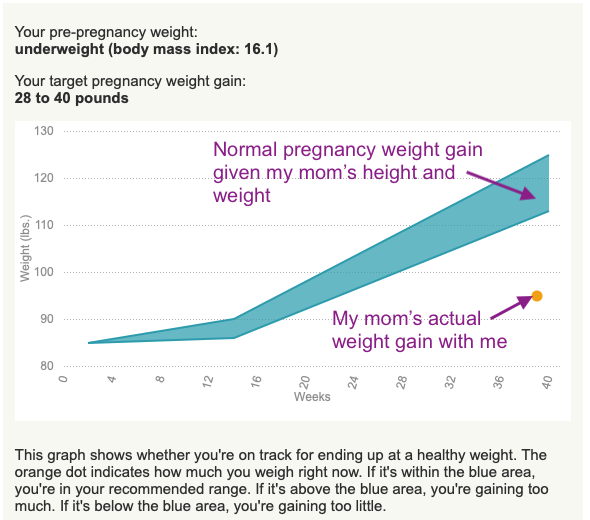 The graph below shows that, even for her, she was grossly underweight. To sum it up, I think her dieting during pregnancy may have epigenetically impacted my gene for IGBF-2! Of course, there’s a lot we didn’t know back then, and knowing this now doesn’t help me much personally for now. I will still continue my own care as I have been! Still, for any of you out there who are pregnant or know someone who is, make sure they know to eat well during pregnancy! btw: your Buchinger blog was so inspiring that I booked 10 days fasting package and came back this Sunday! Hi Adi – great to hear! Did you have a good stay at Buchinger? Sure, enjoyed every single second there. Fasting is my new hobby with great results. Thanks again! Great to hear! Thanks for forwarding the article!